Cudley the Cowlick drops the TMNT off in the world of Archie Andrews and his friends. 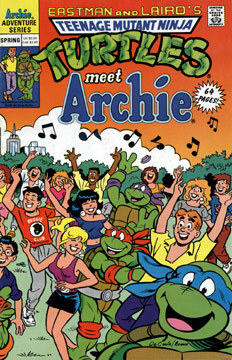 The TMNT have to help Archie save Veronica from her kidnappers. 23 pages. April, the Turtles and Man Ray discover a pirate ship inhabited by the walking dead. 16 pages. An ecological mini-comic. 4 pages. The Shredder creates a mutant mastadon man to terrorize the Turtles. 12 pages.